Quite a bit has happened around here since my last post. My dearest friend May is still sad, very sad. She has laid her father, her Pa, to rest and while there is relief I know her heart is broken. I’ve been there for her anyway I can and in any way she needs me. But at the end of the day, in the small hours, the pain is all hers and there is really nothing I can do. There is one thing I can do and that’s give her space and time. Which isn’t easy. When you love someone and they are hurting all you want to do is gather them up, hold them, mother them, comfort them, feed them, love them. But that’s not always the way. So as I give my friend space and try not to reach for the phone every other hour to tell her something pointless. Something that at any other time would have made us both laugh but now seems inappropriate and silly. I find ways to distract myself. I took Kira to the library today. Thursday morning is our library time and she loves it. Today she even got her own library card. I almost burst into tears. How can my baby have her own library card? But she does and knows how to use it. I have one too of course and as we were checking out her books today I suddenly thought hey…”where do you keep quilting books”? Over there the woman, the librarian said… are they still called librarians or just people who volunteer at the library? Anyway I followed the pointing finger and another librarian (?) guided me to the 745/746 section…BINGO!! Four shelves of quilting books. I was soooo excited but even more so when 2 books I almost bought on Amazon last night were sitting quietly on the shelf waiting for me. I think I squealed a bit because suddenly Kira leaned into my face and said “mummy doin”? 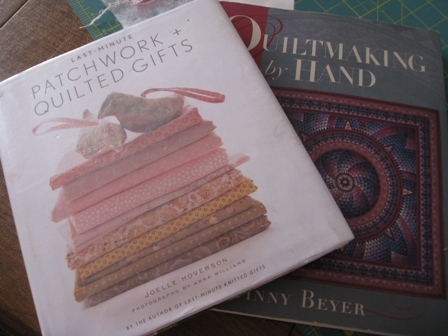 I said mummy found some quilting books and I’m so excited. She then said “mummy sewing”…”sheen” (referring to my sewing machine). I said yes baby then she said “yes baby”. She also gave me another thing to remind me of her. Thanks for the lesson in patience and for “being with me in the library”. Peace and blessings to May at this terribly hard time. I don’t know her, but your love for her rings in every word.